Home » Blog » Marijuana Trimming Jobs: The Most Kush Entry Level Position? Marijuana Trimming Jobs: The Most Kush Entry Level Position? Since the veil has been lifted from the underground industry, the marijuana job market has revealed financial and logistical trends for what it’s like to work as a legal trimmer and how much workers can be compensated. Before examining the current market of marijuana trimming jobs, let’s explore some history of this unique, sometimes lucrative, often tedious position. Since the 1970s, “scissor drifters,” have made the trek from all corners of the country to Humboldt County, California — a northern region of the state where a majority of American cannabis cultivation has been carried out. While marijuana growers and technicians maintain high levels of expertise in horticulture and marijuana production, marijuana trimming jobs represent entry-level pursuits that are attractive to travellers, novices and those looking to make quick, untaxed income. The lore surrounding marijuana trimming job wages can be likened to a big fish story, since most trimmers are paid by the pound. I’ve heard reports of individuals making $1000+ per day; I’ve also known people to make around $150 per day. Really, it depends on the grow operation and the speed and effectiveness of the trimmer. NPR reported in 2014 that speedy black market trimmers can make around $300-500, which speaks to the data I’ve confirmed with other cannabis industry professionals. No Regulation = No Rights? While the payout some trimmers receive may seem glamorous, the cannabusiness is notoriously inconsistent when it comes to employee treatment and compensation. Since the black market obviously operates under the law, there is no one to go to if you’re a trimmer who, say, was promised a large sum of money and never actually received it. Unfortunately, stories like this are more common than you’d want to believe. Now that we’ve explored a brief background of marijuana trimming jobs, the question is: what exactly is a trimmer? Why do they exist? The brass tacks of trimming all comes down to that pretty little cannabis flower you find on a mature plant. Trimming is essentially the process of snipping excess plant matter from cannabinoid-rich flowers in order to create a bounty of manicured buds to be sold in cannabis dispensaries. There are a number of reasons why trimmed buds have become the standard for retail marijuana flower. For starters, mature cannabis leaves, such as the larger fan leaves and small sugar leaves contain drastically lower proportions of cannabinoids like THC and CBD than the buds. For this reason, trimmers keep only the “best” parts of the bud to sell. If you’re wondering where all the remaining plant matter goes after trimming, never fear! Excess leaves, stems, etc. are called “trim” and they can be effectively used to create cannabutter and cannabis concentrates by heating the the trim in oil, or using CO2, Butane, or another solvent to separate the essential cannabinoids from the plant matter. Another reason for snipping away plant matter is because smoking the leaves creates a less appealing taste and a harsher smoke. I have smoked cannabis from a plant that I trimmed poorly, causing my lungs to receive more than their regular dose of exercise. From a financial perspective, trimming allows for customers to get the best price for the best buds. No one wants to buy flower that doesn’t come with maximum effects. Additionally, poorly trimmed buds are aesthetically displeasing and keep the product from being sold. Marijuana trimming jobs fall at the end of the cultivation process and are one of the last processes before shipping the product out to be sold in retail stores. While you can prune leaves along the way to allow for more light exposure to the plant, trimming occurs after harvesting colas from mature plants. There are myriad methods for how to trim; however, there are two formal schools of thought for processing: wet and dry trimming. The names imply the processes pretty clearly. Wet trimming is perhaps the most used method, since it is ostensibly easier to snip plant matter away while the leaves are still ductile. If you choose to let the buds cure first before trimming, it is less efficient as the dried leaves are harder to snip. Trimmers wear disposable gloves at all times when doing their job, otherwise their hands would be covered in impossibly sticky resin from the buds. Now that recreational and medical cannabis is starting to infiltrate states throughout the country, a more established job market has presented itself and the desire for marijuana trimming jobs is only continuing to grow. Even in the legal market, marijuana trimming jobs still offer consistently better wages than most entry level careers. Pay starts around $12-15 as a base for most operations, though some operations still pay by weight, allowing for trimmers to make upwards of twenty dollars per hour. While the cannabis industry may be difficult to break into, the job market allows room for growth and promotion for marijuana trimming jobs. 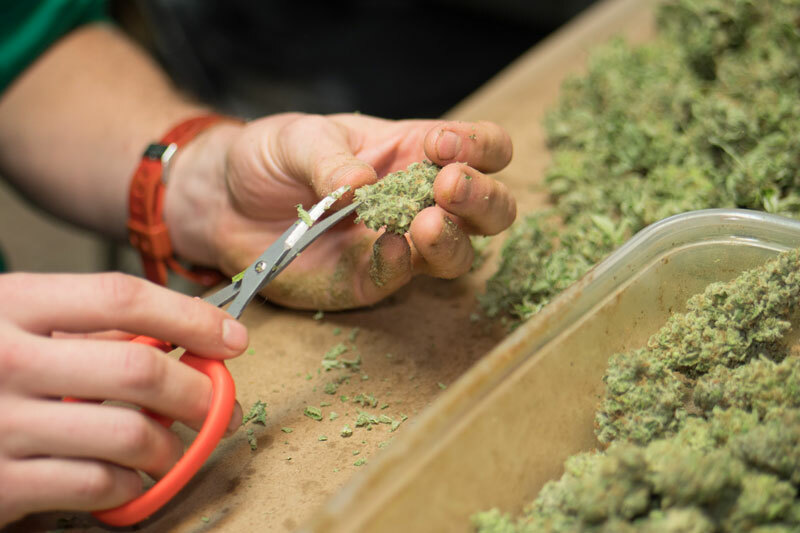 Entry level trimmers who work alongside grow operations can work their way up the ranks to more professional pursuits like assistant growing, or eventually even leading a grow operation. There are even possibilities of raking in around $90,000 a year in salary after acquiring a top tier cultivation job. Even in the exciting cannabis industry, no job is going to be perfect. Given the amount of people actively pursuing marijuana trimming jobs, it’s good to take a look at what makes this job worth working. Starting with the pros, I will reiterate some key points mentioned above. Firstly, as far as breaking into the cannabusiness goes, trimmers make better money than a lot of entry level budtenders or dispensary receptionists. Since the job is often compensated according to weight, it’s a job that actually rewards workers for the harder and more efficiently they work. Furthermore, trimmers benefit from having direct contact with cannabis plants, which allows them to gain hands-on experience that other weed industry workers may not be able to access. One of the best perks of working as a trimmer is free or discounted weed. At least in the underground operations of yore, happy workers might go home with a heavy bag of flower or trim at no extra cost to them. For the cannabis enthusiast, this perk likely outweighs the rest as it promises some of the best, freshest product around. The predominant con you will most likely hear expressed about marijuana trimming jobs is how mundane the work can be. I won’t lie, trimming is a tedious task. You are essentially repeating the same motions over and over, so it is imperative that job candidates can sit or stand for long periods, without losing too much steam over the shift. The hours can also be pretty tough. In the black market, shifts could last upwards of sixteen hours a day. Even in the legal market, twelve hour shifts are certainly not unheard of. Most trimmers listen to music or audiobooks while they’re doing their work as a form of entertainment, while still maintaining focus. While Humboldt county still experiences a rush of eager trimmers every summer and fall, trimming jobs have become more widely available throughout the country. Grow operations come in many shapes and sizes, allowing for significant variation between each position. Metropolitan areas in Oregon, Washington, Colorado and California boast the most marijuana trimming jobs as all four states have medical and/or recreational legalization. A quick Google search, however, will show you that there are trimming jobs located in pockets of each state. The best way to make a decent haul of cash and cannabis with marijuana trimming jobs is admittedly by working in the black market, but there are no guarantees of getting what you’re promised. There is also a history of employers hiring only attractive, female trimmers for their operations, which presents a number of issues when it comes to workplace etiquette and safety. Part of what makes the cannabis industry so intriguing is the mystery surrounding it. Even as more states become legal, the black market industry is still going strong. As the business expands and more legislation is passed, the job market could go in a number of directions. Surely, there is a lot of interest surrounding the cannabis job market, but whether marijuana trimming jobs will continue to pay enough to support its workers is a reasonable concern that many skeptics, including myself, have in the back of our minds. As the industry continues to surge, it’s important to keep up to date on all local and statewide legislation. Check out your state’s “.gov” website, or visit Norml.org to find out more about how to be an advocate for fair cannabis legalization practices. How Much Do Marijuana Industry Jobs Pay?